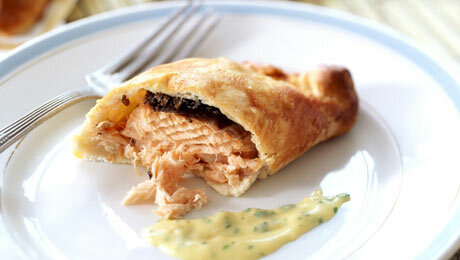 This is a delicious fish recipe even without the Hollandaise. If you don't feel confident to make your own Hollandaise, store-bought will do as well. Preheat the oven to 180°C/350°G/Gas Mark 4. Saute the mushrooms in some butter, then remove and pat dry with some kitchen paper. Roll out the two sheets of pastry on a lightly floured surface, and brush the surface with egg wash.
Place the spinach on to the pastry leaving approximately 1" around the edge, then place the sautéed mushrooms to top. Lay the Hake onto the mushrooms and season with salt and pepper. In a separate bowl mix the eggs and shallots, then place on top of the Hake. Sprinkle with the herbs then brush the edges of the pastry with the egg wash.
Place the top sheet of pastry on top of the Hake then seal tightly. Transfer to a baking sheet and place in the preheated oven for 30 – 35 minutes, then remove and allow to stand for 15 minutes. In the meantime to make your hollandaise, firstly melt the butter in a saucepan over a gentle heat. In a separate saucepan heat some water and place a glass or stainless steel bowl on top. Pour in the white wine vinegar and lemon juice then add the egg yolks and beat continuously until light and creamy in consistency. You need to be very careful at this stage because the line between creamy and scrambled is very fine. Remove the bowl from the heat then pour in the melted butter, whilst continuing to whisk at all times. If after adding all the butter the sauce is still a little thick for your liking whisk in some boiling water and a squeeze of lemon. Place the Coulibiac onto a serving platter, and serve with Hollandaise Sauce.